This article talks about 4 free online double bubble map maker websites. Double Bubble Map is used to compare and contrast two items. A double bubble map has two larger circles representing the two things or ideas surrounded by connected smaller circles that represent the similarities and differences between them. The similarities are represented in the middle of main circles having a connection with both of them. Whereas, the differences are represented on the opposite side of main circles which only have a connection with their respective circle. Here are 4 free online double bubble map maker websites. These websites offer simple to use editors where you can easily make double bubble maps online. With these editors, you can make personalized double bubble maps online and download them to your computer. So, let’s begin the list and discuss these editors one by one. 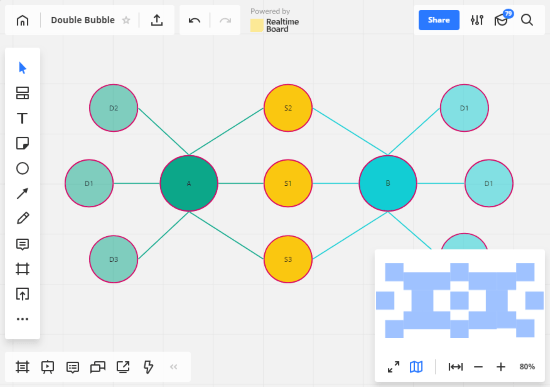 The first website to make double bubble map online is RealTimeBoard. It is an online whiteboard application where you can easily draw double bubble maps. This editor packs all the tools you need to make a visually appealing double bubble map. To make a double bubble map, you can drag & drop a circular shape from the toolbar. After adding the shape to the canvas, you can resize it to any desired size and can also make it oval shape as well. A simple click on the shape opens customization options from where you can fill the shape with a color and choose a color for the border. You can also change the width of the borderline and add text inside the shape. Similarly, you can add more shapes and customize them accordingly. You can also copy-paste an existing shape along with its customization and edit it to make desired changes. When you select a shape, four blue dots appear on each side, click and drag any of those dots to another shape to make the connection. You can also import images from your local storage and use them in the map. The map is automatically saved in your RealTimeBoard account from where you can share it via email and invite others for collaboration. You can export the map as PNG, PDF, or CSV file and generate HTML embed code as well. 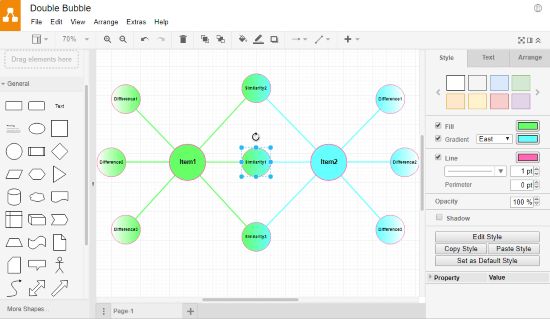 As a free user, you can create and store up to 3 diagrams at a time with up to 3 collaborators. Make double bubble map online with RealTimeBoard here. The next online double bubble maker website on this list is Draw.io. 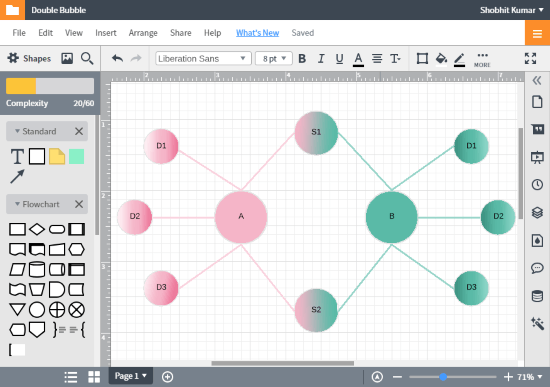 It is a free online diagramming tool where you can make all sorts of diagrams and style them with colors and other design options. To make the double bubble map here, add a bubble/circle shape from the shape toolbar. Select the shape to get the customization options on the right side panel. This editor gives you a Style, Text, and Arrange tab for customization. The Style tab gives you options to change the shape color, borderline color, borderline width, borderline type, and add shadow. You can also add a CSS script for the style here or copy the current style script to apply the same style to other shapes. In the Text tab, you get text formatting options. Here, you can select font face for the text, set text size, format, color, position, and opacity. And, from the Arrange tab, you can set the shape size manually, change its position, and rotate it on a certain angle. You can also add data and URL to each shape as well. Connecting the shapes is the same as RealTimeBoard, select a shape to get four arrows on each side of the shape. Then, click and drag it to other shapes to make the connection. After making the connections, you can customize the connecting lines same as the shapes. In the end, you can export the map as a PNG, JPEG, SVG, PDF, VSDX, HTML, or XML file to your local storage or to popular cloud storage platform including Google Drive, OneDrive, Dropbox, GitHub, and Trello. Try this online double bubble map maker here. LucidChart is an online diagramming tool where you can create various types of diagrams online. As a free user, you can make and keep up to 3 diagrams in your account. If you already have 3 diagrams in your account, you can delete one or all of them and create new diagrams. You can download your diagrams as JPEG, PNG, SVG, PDF, and VDX file. You can also generate public shareable URL and HTML embed code by publishing your diagram on LucidChart. The process of making double bubble maps is simple and straightforward here. Like all the other editors on this list, LucidChart also has a shape toolbar from where you can drag & drop shapes to the canvas. After adding shapes, you can add text inside and customize the visual appearance of the shape. You can copy-paste a shape or add new shapes from the toolbar to complete the bubble map. From the other toolbar at the top of the canvas, you can fill a selected shape with a color, change opacity, and add a gradient effect. Similarly, you can customize the text format and change its size and color. When you select a shape, four red dots appear on each side which you can select and drag to make connections. By default, the connecting line has an arrowhead on one side. To remove that, tap on the line and change the arrowhead option to none from the top toolbar. You can apply other customization options to the connecting lines as well. This way, you can make heavily personalized double bubble maps with LucidChart and save them to your computer. Give this online double bubble map maker a try here. 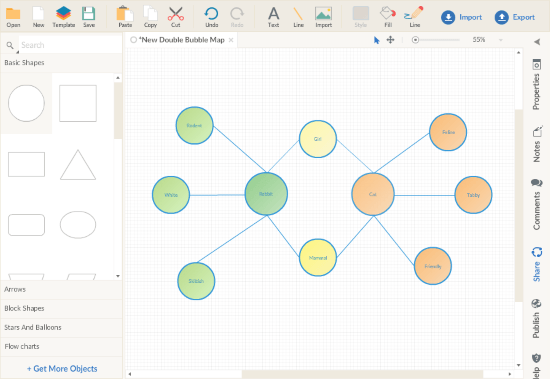 Creately is another online diagram editor where you can make double bubble maps for free. As a free user, you can create up to 5 public diagrams within a single project and add up to 3 collaborators. You can save the diagrams on your Creately account or export them as JEPG or PNG file. Creately offers a few double bubble map templates which you can edit to make your double bubble map. If you don’t find any template useful, you can create a blank document and start making double bubble map from scratch. To do that, you can add shapes from the shape toolbar and label them as per your map. When you select a shape here, 5 options appear on top it. With these options, you can customize the shape label, make connections, change shape order, edit shape properties, and create a new connected shape with shape properties. With the Fill and Style options from the top toolbar, you can personalize the appearance of shapes and connection lines by changing color, border width, border color, and border style. After finalizing the double bubble map, you can download it using the Export option. You can try this online double bubble map maker here. These are the free online double bubble map maker websites where you can easily make double bubble maps. All these websites offer almost similar options and have the same procedure to make double bubble maps. Give them all a try and share your opinion with us in the comments.